"As well as my work in London, I provide surgical treatment to victims in conflict zones such as Afghanistan, Iraq and Syria. In 2015 I established the David Nott Foundation with my wife Elly. The Foundation helps surgeons to develop their operating skills for warzones and austere environments." 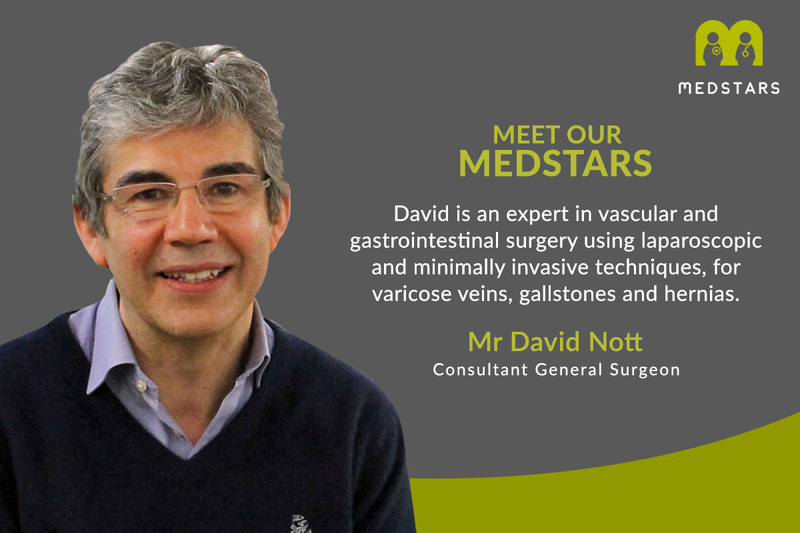 David is one of the most renowned and respected general surgeons in the UK, and a secret Medstars hero. He is proven to perform high risk complex surgery in the some of the most demanding conditions imaginable. David is expert in vascular and gastrointestinal surgery using laparoscopic and minimally invasive techniques, for varicose veins, gallstones and hernias in London. "Thank you for the “repairs” and for keeping me on the road, David!" "David is first class. A great surgeon, and a good guy with a nice bedside manner that puts patients well at ease. Thank ..."
I gained my medical degree from Manchester University and in 1992 gained my FRCS from the Royal College of Surgeons of England to become a Consultant Surgeon. I have been a Consultant Surgeon at Chelsea and Westminster Hospital for 23 years where I specialise in general surgery. There, I am the clinical lead for laparoscopic cholecystectomy - key-hole surgery to remove the gall bladder and gall stones. I also perform vascular surgery, gastro-intestinal (upper) surgery and general surgery for private patients at the Bupa Cromwell Hospital, London. I was the first surgeon to combine laparoscopic and vascular surgery. I provide vascular surgical support to the oncology surgeons at the Royal Marsden Hospital and helping them perform complex cancer surgery, on gynaecological, urological and sarcoma patients. For the past twenty three years I have taken unpaid leave each year to work for the aid agencies Médecins Sans Frontières, the International Committee of the Red Cross and Syria Relief. I have provided surgical treatment to the victims of conflict and catastrophe in Bosnia, Afghanistan, Sierra Leone, Liberia, Ivory Coast, Chad, Darfur, Yemen, the Democratic Republic of Congo, Haiti, Iraq, Pakistan, Libya, Syria, Central African Republic, Gaza and Nepal. As well as treating victims of conflict and catastrophe and raising hundreds of thousands of pounds for charitable causes, I teach advanced surgical skills to local medics and surgeons when I am abroad. In London, I teach the Definitive Surgical Trauma Skills (DSTS) and Surgical Training for the Austere Environment (STAE) courses at the Royal College of Surgeons. In 2015 my wife and I established the David Nott Foundation to further the principles and improve the standards and practice of humanitarian surgery. The Foundation achieves this through the education and training of medical professionals and raising the profile of humanitarian surgery in the UK and worldwide. My wife and I have a daughter named Molly.